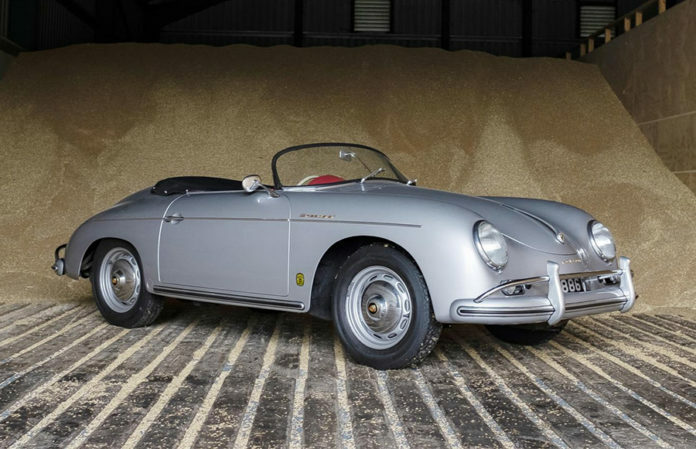 An original Porsche 356 A Speedster, one of the most collectible Porsche models in the world, will be offered for sale at Silverstone Auctions’ upcoming Race Retro Sale on 23rd February at Stoneleigh Park, Coventry. Recognised globally as the ultimate small sports car for its nimble, light weight and timeless, simple shape, the example for sale is one of an estimated 555 356 A T2 Speedsters built in 1958, the final and most desirable production run of the model. Presented today in beautifully restored condition and converted to right-hand drive, the matching numbers Speedster will go under the hammer guided at £280,000 – £320,000. This particular example was supplied new through well-known Porsche dealer Hoffmans of New York finished in Silver with a Red leather interior. Distinctive features of the model include the low, removable windscreen, lightweight body, minimal folding top and side curtains in the place of side windows. The minimalist interior includes a large, two-spoke steering wheel, lightweight racing style bucket seats, light grey carpet, and leather covered door panels and upper dashboard. 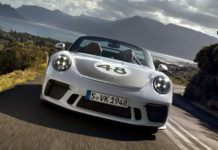 Located at the rear of the car, a 1,582cc flat-four engine capable of producing 60bhp with 4-speed transmission offers the sporting performance that made the Speedster popular with owners who enjoyed taking to the race track. The T2 models also benefits from numerous upgrades, including an improved transaxle and steering box design, among other refinements. 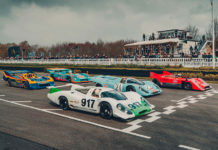 Having spent most of its life in America, the Speedster was acquired by its current owner, a serious and noted collector, from an auction at Pebble Beach, California, in 2015. It was then imported into the UK and immediately entrusted to JD Classics of Mayfair for a professional conversion to right-hand drive. Today the car still retains the original engine and gearbox, making it a full matching numbers example. 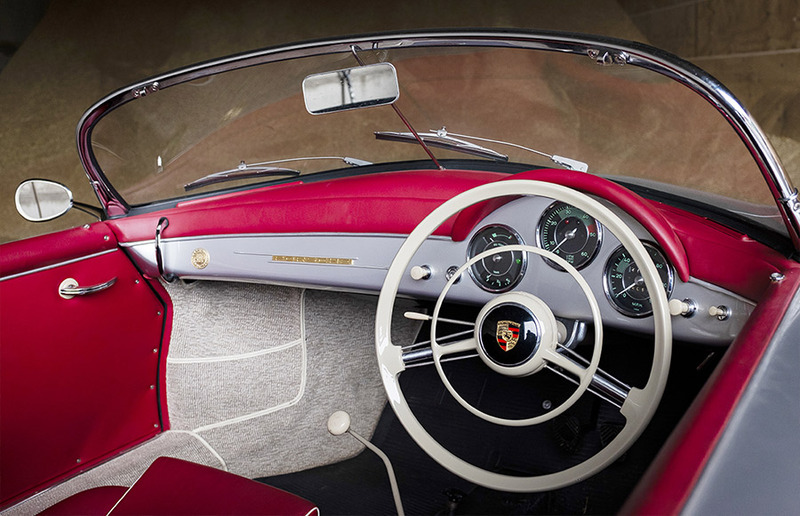 The Porsche Kardex also confirms it was originally supplied in Silver with Red leather, the same combination and specification of the car today. Having spent the last few years in professional storage with little use, the Speedster now comes to market from a significant collection with all import taxes paid and UK registered. “The Speedster variant captured the imagination of A-list celebrities and film stars across the world and today offers the potential buyer a rare Porsche icon that can be used and enjoyed, whilst still offering a true chance of a solid investment,” concludes Nick. The Porsche is accompanied by a CD showing the full restoration, a copy of the Porsche Kardex, original owner’s manual, tools and jack. Next articleThe New 600HP Alpina B7 xDrive Sedan Has A Top Speed of 205 MPH!